Gene's fans watched him in the movies, heard him on the radio, and read the official "Gene Autry" comics. But best of all they saw their cowboy hero, live and in person, right in their very own town. Whether appearing with his rodeo in Madison Square Garden or by himself in hospital wards, Gene knew how important it was to connect with the fans. Decades later, fans still recall their cherished memories of meeting the Cowboy. Gene Autry began touring in the mid 1930s. These shows were small, one-night stands which Gene did between his films. 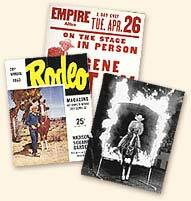 The Gene Autry Rodeo started touring in 1939 playing county and state fairs, then larger venues. Larger personal appearance tours began after World War II and continued through 1958. A smaller version toured in 1959 and 1960. Gene then appeared solo in 1961, his final year making personal appearances. The Gene Autry Hit Show started touring in 1949 and continued through the Fifties. It was a musical variety show with Gene, Champion and Little Champ, Smiley Burnette, Pat Buttram, Gail Davis, Rufe Davis, the Cass County Boys, and other well known performers like the Hoosier Hot Shots. This show was performed on a stage in auditoriums up to 16,000 seats – never less than 3,000 – and toured in the Spring and Fall (in the Summer Gene made movies) up to 85 one-nighters at a time, seven days a week, two shows a day. This show played in England in 1953 at Empress Hall, London, without Smiley and the Hot Shots. The information on Gene Autry's Personal Appearance Tours is sourced from the files of Gene Autry Entertainment. We will be adding additional tour information, such as Gene's British Isle Tours in 1939 and 1953, which is accessible from our archive. Gene experienced two major fires in his lifetime and many of the documents for his tours were destroyed. We are piecing together the missing years thanks to personal appearance announcements made on Gene's Melody Ranch Radio Show. This of course will take longer to compile but we do plan to add it to this section. To see a map and listing of Gene Autry's Personal Appearance Tour dates, click on the red year below. We've also presented all of the information, sorted by location, in one big list in the All Tour Dates section. One list of all tours, sorted by city.